GK Memovie - excellent multimedia portal template for CMS Joomla developers of Polish studio GavickPro. The original design layout contains several color schemes, which are ideally suited for sites devoted to the world of cinema. Availability proprietary platform allows Gavern pattern load quickly and correctly operate on mobile platforms. 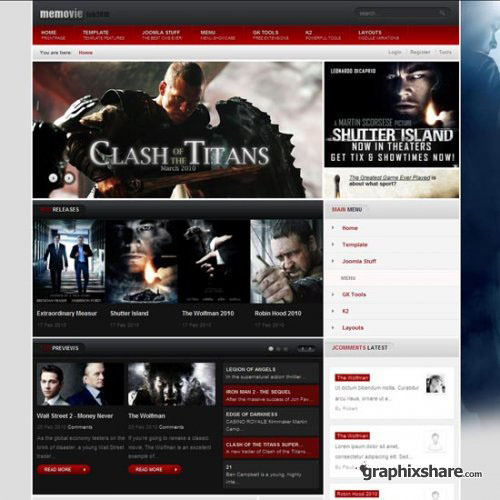 Additional extensions studio presented in the installation package, allow to arrange a convenient catalog of films with the ability to view online trailers and teasers. Flexible modular design provides optimal arrangement of all elements for easy navigation. Built-in support of popular content management manager K2 adds new possibilities for publishing and file management. GK Memovie - a great solution for creating modern and professional web - projects.